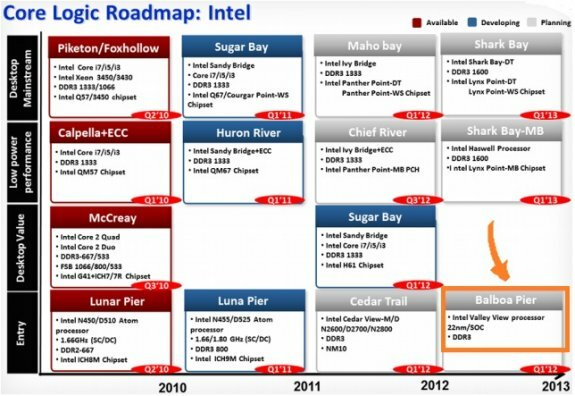 DailyTech reports a newly leaked core logic roadmap from Intel confirms that the 22nm "Valley View" Atom chip will arrive in 2013. The slides suggest Valley View will offer a Turbo Mode, which will be different from Ivy Bridge and Haswell, and support for up to four cores, 8GB DDR3 and USB 3.0. VWV is part of a platform named Balboa Pier, which the slides indicate is a direct successor to CedarView, one of Intel's current mobile platforms. The chip will apparently ditch the third party PowerVR graphics from Imagination Technologies plc (LON:IMG) and instead use Intel's own in-house integrated GPU, found in Ivy Bridge. The Ivy Bridge GPU is estimated to be 20 to 50 percent faster than the GPU in Sandy Bridge, which in turn is more powerful than the old PowerVR chip. In other words, this will be a big bump graphics-wise -- a clear effort to keep up with Advanced Micro Devices, Inc.'s (AMD) graphics-centric approach to systems-on-a-chip. Overall graphics perfromance is expected to see a 4x bump. Intel engineer Jesse Barnes explains to a public mailing list (whoops! ), "ValleyView is a CedarView-like chip but with an Ivybridge graphics core."